Go carbon or go home  can small brands survive with just alloy bikes? Discussion in 'Downhill & Freeride' started by daisycutter, Jul 19, 2012. Over the last year weve seen small brands like Intense and Transition join mid-sized companies like Niner and Pivot in offering carbon fiber bikes. As we spoke to them about it, the discussion turned to the challenges of small brands scaling up in todays marketplace  that they need to go beyond alloy bikes and offer a carbon fiber model in order to grow. The challenge is one of scale and resources. And by resources, were not just talking about the costs of production, theres a finite number of quality manufacturers willing to do small runs, and the R&D process becomes much more involved with carbon. That means more people, new skills and lots of time. So we spoke to these brands about the process. We also spoke to Turner and Foes, two small, storied brands that are facing the reality that consumers are less and less likely to spend more than $2,500 on an alloy mountain bike frameset. Yet, thats often what it costs if you want the latest and greatest hydroformed, fully modern alloy frame, particularly if you want it made in America. We also spoke to Moots, who only produces titanium bikes, for a different perspective. Transition's first carbon fiber bike, the 160mm Covert, is coming soon. BIKERUMOR: Do you think a brand today can grow or remain relevant in the mainstream without offering a carbon fiber bike? NINER: I think that it is increasingly difficult to do this. Carbon has so much unexplored potential as a material  this is where companies are investing their development time and funding. To maintain relevance without a carbon product will be tough. FOES: Our company is different than a lot of big companies. Big companies can experiment more because they have the budget and a lot of their stuff is made overseas. We dont make anything overseas, I like to hand fabricate our stuff, so if I did decide to do something in carbon, wed have to go overseas, and thats just not an option for us, so wed look to do something else. For us, not having a carbon fiber bike hasnt been an issue. If we had them, we could probably sell more stuff, but Im just not interested in going overseas. in the mainstream. Not a high end brand. A brand like Turner Bikes, or any other niche brand, can because its a higher end item thats aimed at a different segment. The big advertising budgets of the big companies have conditioned riders to think that carbon is the pinnacle. A small brand, particularly those in the dirt jump/downhill segment could grow for quite a while on just metal frames. TRANSITION: I think they can in certain categories, and in other categories, no. There are certain price points and genres that without carbon you could probably exist but you wouldnt be growing your market share. If we look at our first bike, a 6&#8243; all-mountain enduro bike, we could have kept the Covert alloy only, but itll do better with the new carbon version. I feel like were one of the smaller brands doing it, but were doing our own thing, not rebranding some off the shelf crap. Were at that size where were right on the cusp, but we definitely see some benefits to doing it. INTENSE: Carbon is so widely accepted now, and it offers so many advantages over aluminum, having said that there is still a place for aluminum, and there are some people that really do not like the idea of carbon used in mountain bike frames. If you dont offer carbon as a company, you are limiting how many customers will want your product. I would say that it would be very difficult to grow a company without offering carbon. PIVOT: I think it would be difficult to make a go of it without carbon. Many customers simply want carbon fiber and its part of their check list of features they want or think they want in a bike. MOOTS: Absolutely. A securely niched, well respected non-carbon fiber brand with a long history of designing and building performance titanium bikes can be very relevant in the high-end bike market today, and going forward. For Moots, with the introduction three years ago of our RSL line road, mountain and cross bikes which have ride qualities similar to high-end carbon bikes with the important addition of lifetime durability and increased comfort, we have seen significant growth in our business worldwide, especially in the U.S. and Europe. We are continuing to see more and more customers make the switch from carbon to titanium as they realize the ride quality in terms of stiffness and responsiveness is really not that different. And, many times the weight differences are minimal or non-existent. On top of that there is a lot of cyclist frustration with the lack of durability in carbon bikes, even at the high-end. So, the combination of those three things have certainly benefitted us. Its also been interesting to see more interest in Moots and titanium from young male riders and women. This is encouraging. For the younger cyclists, some are choosing titanium on their own and some have some parental influence. Weve had a couple very recent stories of young cyclists (early 20s) purchasing Moots road bikes for racing because they have broken too many carbon frames and the costs are becoming too prohibitive to continue to pay the crash-replacement prices, not to mention the inconvenience of not having ones bike for a period of time while waiting for the replacement. For Ti to be relevant in the mainstream (high-end mainstream), wed likely need to have a top tier road team riding Ti bikes and some more top world cup mountain bikers riding Ti. We believe todays titanium technology is there on the product side, but because it occupies such a niche space, there is no company and/or marketing scale to make that financial equation work. On the mountain biking side, the product is clearly there and its a bit more doable from an athlete support standpoint. But, still to really justify the investment in the top tier rider sponsorship, titanium as a whole would need to achieve some level of market critical mass first. And to truly be mainstream, price points need to be at the mid-level to appeal to that broader audience. A properly US-made Ti bike will not hit those lower price points. BIKERUMOR: Do you think riders are still interested in high end alloy frames? NINER: Yes, but the customer base has become more specific than in the past  we still see strong interest in longer travel alloy trail/all mountain bikes. I suspect that this is due to two things. One, there are still people out there who worry about carbon durability, particularly in the long travel market. As carbon continues to prove itself on the trail, I believe some of this distrust will dissipate. The second issue is driven by market size. The more frames within particular model you produce, the less expensive you can make it for the customer. While the longer travel market is growing, it has not reached the same economies of scale that you see in cross country or road bike markets. This means that there is still a good argument for comparison shopping between alloy and carbon trail bike models, unlike what has happened in road bikes, where you can get a very nice carbon option for what used to be an alloy-only price. FOES: Were still selling frames, and we have customers that have had our frames for a long time. So yes, I think people are still interested. TURNER: Absolutely. It keeps us, and others like us, in business. Its small volume, and the number is shrinking as the lightweight lure of carbon attracts more customers. Part of aluminums draw is the durability. A dented alloy frame can be ridden for years, but impact a carbon frame and its expensive, usually not warrantied and needs immediate replacement. TRANSITION: I think some. There are people out there, even experienced, skilled riders, that prefer alloy. It comes down to personal preference. Theres definitely still a market for it. The size of that market is the question mark. INTENSE: There is a certain customer that still loves that high end aluminum, which to some people is a contradiction in terms, and there is a certain customer that is dedicated to buying Made in USA. There is a lot of value in buying a frame where you know it was crafted by a human, and you can get a custom color. PIVOT: Absolutely. Our alloy models sell very strongly. More cyclists are discovering the stiff and responsive ride quality of todays well built titanium bikes, like our RSL models that incorporate leading edge design and technology and offer similar performance levels to high-end bikes made from other non-titanium materials. A rapidly growing number of high-end carbon bikes have become more expensive than high-end titanium bikes. This was not the case five years ago. So, when you look at the true value equation; cost  performance  durability  pride of ownership, titanium offers unique and compelling value. The commoditization of carbon is making it more and more challenging for cycling consumers to understand what they are really getting for the prices they are paying. The lifetime nature of a well built titanium bike is appealing to many cyclists, especially as the struggles with the breakage issues of carbon frames continues. Socio-culturally, since the economy crashed in 2008/2009, more and more people are valuing hand-built, U.S. based brands that have values similar to their own. In the bike world specifically, the whole notion of Asian-made, non-durable disposable bikes is not feeling real good to a growing percentage of high-end cycling customers, especially as carbon frame and bike prices continue to rise. For us at Moots, all of these factors lead to a much more personal and emotional experience and relationship between our owners, their bikes and the Moots brand. Its pretty special. Well, if Evil isn't a small company who is? I'm just wondering what nicolai will do. I didn't even know Moots were still in business, wow just searched and even Dean are still in business and their range looks better than it did a few years ago. Nicolai will survive making Ebikes and selling DH frames to bike parks for rentals as they are bombproof. They are a very niche company anyway so probably nothing will change. They have a similar model to many custom ht/steel is real company. Their offer is just wider. For them nothing will change. Though it's not impossible for small companies to go Carbon - not only Evil but Zerode experiments with it, John Cowan made a carbon dj ht and plans to make some carbon park fs bikes. I am surprised nobody brings the custom aspect. It is 'easy' to get a customer a full custom steel, alu or ti frame. Try that with carbon! That should be the route Foes, Intense and other should go. Moots is already offering full custom in parallel to their production bikes. If bike customers weren't such muppets, and would stop believing everything the bike industry tells them, then this wouldn't be an issue. I remember, just a few short years ago, being hassled by 75% of the forum members for 'liking' carbon and saying it would take over. That number is flipped and now only about 25% are doubters. Aluminum is so dirty - I expect we'll see less and less of it, moving to the lower end bikes where carbon isnt feasible, and then a little resurgence in steel as alu fades as the primary frame material. and carbon cleanup is not? consider general operating conditions, employment practices & people culture, impact on immediate surrounding community, and environmental/health and safety aspect of Chinese carbon production facility versus first-world alu production shop. INTENSE: We try to keep as much of our bikes Made in USA as possible. For the carbon models, we still make all the links, bolts and pivots here, and we assemble them here. Are Turner still US made? After SAPA doesn't do bicycle frames anymore? A dented alloy frame can be ridden for years, but impact a carbon frame and it&#8217;s expensive, usually not warrantied and needs immediate replacement. I haven't had to repair a carbon frame, but my understanding is that there are more and more places that will repair (for $400-$500) some fairly major carbon frame damage. That was my thinking as well. Though I don't care about US vs Tw. Both technologies have their problems. As mentioned above I don't care about US produced but I really feel there are few really useful improvements in the dh market in the last few years. Some bikes have one wow factor quality but in the end don't ride any better. For trail-am you get some new trends but that has nothing to do with carbon. Maybe when new material technologies go into all parts and we will be able to build 13-14kg dh bikes, 10-11kg durable trailbikes, then I'll be interested. I think Greg aka. Mr.Plow on RM does carbon repair. The problem is that if you had an impact on a rock or something that is big enough to visually damage the frame (or not) you'll have to x-ray it before anyone can predict that a repair would be suitable. There is a guy on mtb-news who built a session 9.9 with enve wheels etc. and in the end he said that the bike felt too light for dh. The fact that both carbon Trek Session 9.9 and Santa Cruz V10's are available for rent - at normal demo prices - in Whistler would suggest to me that the durability concerns with carbon are utterly unfounded. These demo bikes see more action in one week than 75% of DH frames see in their entire lifetime. Furthermore, most renters purchase damage insurance ($50 flat rate for entirety of rental period), and thus have even less incentive to protect the frame than the individual purchaser. I'm not certain what this "added expense" of carbon frames is supposed to be. The SC V10 frame retails for $3300: Hardly exorbitant, and a whopping $300 more than the similar M9. 10% seems a reasonable premium if you consider that the V10 is probably the most sought after frame at the moment. AFAIK, most carbon frames are made in Taiwan. Taiwan is a first world country. As for the v10c - I love how you quote prices selectively: Session, Fury and Antidote are very expensive. Demo full bike suposedly too. So for the most part carbon = expsensive. The M9 comes with a Cane Creek shock and the angleset. V10 is a Fox and angleset. M9 is a better value no matter how you look at it. Regarding carbon, for DH theres few companies I'd trust. GT is one of them, simply because they built the Fury to last. Only reason I'd trust the V10 is because of how good everything else is that they make in carbon. Thats about the end of my list though. Heard of too many problems from other companies from reliable sources. If its a bike thats got a good chance of crowd surfing the rocks, I'll take a material I trust anyday. The interesting question is: who will buy that bikes and for what price? for 3 g's, I just got my GF a new carbon 140 mm FS bike with decent components. at my LBS I see hi-end alu bars for $80, and decent carbon bars for $100 or so. carbon is becoming pretty mainstream and increasingly affordable. This is what it's coming down to. The costs of producing carbon frames is going to become less than aluminum eventually, today the costs are very close. small brands will survive if they can offer customizations and quality fabrication. I'm contemplating a new trail bike. all those new fancy carbon bikes from the big companies sure are enticing, but none of them offer what I really want: a gear box. as I see it, Nicolai is my only option. Maybe Zerode, but I can't get their darn website to work to see if a trail bike is in the works. One carbon Zerode trail bike has been made. Zerode will have to make a trailbike that is carbon to clear the 11 spd Alfine. I believe Rob is waiting on a 2nd version to be made to test for a bit. But it sounds like one will happen. Not sure if it will remain 6" or not, but sounds like it. If you put your personal bike through more stress than a Whistler rental, I guess you shouldn't go carbon. Taiwan has a higher per capita GDP-PPP than Denmark, Finland, the UK, France and Japan. 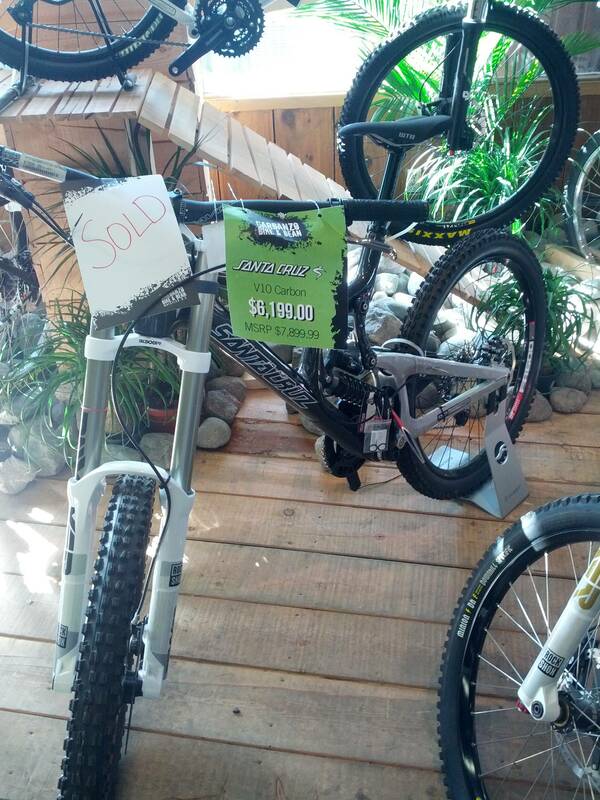 Before I came to Whistler, I was extremely skeptical of carbon DH bikes. Now I'm not skeptical. At all. I think you miss the point. Most people trust some carbon companies in this topic. We just don't see the reason to dish out the cash for a new bike just yet. For now I trust v10c's not really trek as they had some trailbike issues. Antidote and Fury are a bit too rare to tell. If there is an interesting carbon bike I may go for it but I'm in no hurry to sell mine since I don't see how I could have significant gains by selling it. A few years ago (3-5) there was a jump to new slacker/lower geo which gave us more stable bikes, the susp in many bikes was better too. The current upgrade? Slightly lighter (trek and anti are much lighter though) bikes with disputed claims of different ride quality. If I have to be honest I'm much more interested in Carbon DJ bikes. Cowan bikes will soon launch theirs and I've been saying for a long time carbon is a great material for dirt hardtails. I'm seeing myself get a new frame in the next 1 to 2 years. You think this bike might happen by then? interesting. do you know if it's more of a "AM" rig vs. a "Trail" rig. Yes more AM, longer travel slacker angles ETC. Aluminum front to back is far worse from mine to recycle than carbon by a very very long shot. Thats just opening the door - really, I'm no environmentalist, but if you dont recognize the relative severity, you're not looking. I thought this was a great article, and I loved the opposing (and sometimes salty) viewpoints of the company owners. Moots and Transition are both sick. I built up a 5 Spot a month ago and in no way could I want or need anything else from an all mountain bike. It will be around for the long haul. I agree that there is no immediate need to sell one's perfectly fine modern aluminum frame. When time comes to replace one's frame I think that many will and probably should choose carbon over aluminum. The various bugaboos and concerns regarding carbon seem to be unfounded. Same for Aluminum to an extent also. Carbon if made right, for the same weight I'd say is tougher to rock impact than aluminum. this is a great subject, kudos to tyler at bikerumor for broaching it. Lots of good comments here too. its a complicated subject, because carbon is complex. I quote no skid marks comment to highlight the issue. For "the same weight" means something when we're talking carbon. We (SCB) use thicker walls and different material for very specific parts of the frame in carbon to help with impacts in areas that are prone in crashing, when on an aluminum tube you are stuck with a wall thickness that can't be tailored around the circumference of the tube, and there are manufacturing constraints that dictate wall thickness variation limits, taper lengths etc. Its not just about the weight of the subassembly, but where you've used your material, what material has been used, how its been arranged, how its been processed during lay-up and curing, and - maybe most importantly - how stable the process is. how boring. This sh!t is not black metal. It is not the same from each brand, or manufacturer, or frame model, and sometimes, even from frame to frame that look identical. I've heard and read the sentiment that "when carbon gets mainstream it will get cheaper" quite a bit. Unfortunately, this is probably not true, at least when we're talking about bikes on the upper echelon of weight/stiffness/durability. Material costs are set by a few manufacturers of the raw material, and they don't really care about the volume in your bike frames. Labor and energy costs are major drivers, and is the reason a lot of carbon production is done in low labor cost countries. Unless there is automation coming, this isn't going to decrease with volume. And the variability in sizes, models, the short lifespan of designs, and the low volumes means that automation in the labor intensive lay-up, tool loading/unloading processes aren't going to be automated. If bicycle frame welding remained manual, and is much less complex than laying up a carbon frame, I think this is a safe statement to make. ps: please don't post videos of the BMC carbon automated factory in switzerland until they make a mountain bike, and you have bought one, and it weighs less than an aluminum frame. I'm contemplating a new trail bike. all those new fancy carbon bikes from the big companies sure are enticing, but none of them offer what I really want: a gear box. as I see it, Nicolai is my only option. Maybe Zerode, but I can't get their darn website to work to see if a trail bike is in the works. There's definitely a Zerode trail bike in the works, how far off only Santa knows. There's also Alutech doing a Pinion bike. Not a high pivot but possibly more rearward than the Nicolai(can someone map this on linkage for me). Looks like it has lower COG than the Nicolai. Nicolai might be nicer finnish. I have one on order while I wait for Santa with my Zerode, will give a ride report when it gets here. Guessing I won't be a fan of the close gearing, but a double click on the twit shifter will fix that. Zerode DH bikes pedal amazingly. High pivots naturally reduce Bobbing, add a touch of chain/pedaling induced anti squat and they'll ride as good as anything. Definitely within two years. Hopefully within one. Fingers crossed. I'd imagine it'll be aluminum not carbon, to start with but we'll see. and I don't think Alfine 11 speed is certain at all either. I'd prefer 8 speed myself for an All MTN. I'm riding Nuvinci in my hardtail at the moment, and I think I'd maybe even like that in a Zerode AM rig. Has a bit of drag(mines not broken in yet but), and has grip shift, but you can adjust the tension on the shifter, and put it wherever you want. No clicks/indexing, so even if you did misshift(highly doubt it)you'll just be in a different gearing, no grinding through or free-spinning like with a mech. I'm not sold on carbon yet. Locally our trails are very, very rocky and the riding is primarily xc to light all mountain type of stuff and within a relatively small riding community there have been at least 6 broken carbon frames and 1 aluminum frame in the last year. One of those carbon frames being my personal hardtail that sustained a very minor rock impact to the non-drive seatstay. The majority of bikes around here are still aluminum so it's not just a numbers game. Anecdotal information above, sure, but my next bike will be aluminum, likely a Yeti SB95. My carbon hardtail was replaced by custom Ti. In a less rocky area I'd be more inclined to give carbon another go right away. thanks for the info! Maybe I'll get a set of fancy new carbon rims then to tide me over a couple of years while Zerode finishes their development. I looked at the Alutech bikes, and for some reason, they're not appealing to me. But I know nothing about the company and haven't sought out ride reports. Please keep us posted on how it rides, I'd be really curious. Steel is real, aluminum is for schoolin' em. The reality is that we can take out 50% of the cost of the products we replace. We can make a product that truly reduces our reliance on petroleum, and we can make our shareholders happy because the cost benefits translate to higher margins. We focus on higher performing and more cost effective products that just happen to deliver unparalleled sustainability. the combination of the powdery soy flour and a mesh of natural fibers (such as jute, hemp, and flax) produced a composite that is five to six times as strong as particle board. Because of its stiffness and strength, the green composites can be manufactured using one-third of the material by weight, compared to standard particle board. The use of soy protein as a resin also eliminated the need for formaldehyde, a volatile organic compound that can cause lung problems as it outgases into the environment, especially in airtight buildings. &#8220;The formaldehyde issue is something that we have an elegant solution for that no one else can offer,&#8221; says Govang, the company&#8217;s president and CEO.